Measurements of thermal power of milligram bulk samples with well-defined shape and shapeless baggy-samples; powder samples, in the form of thin strips, films, multilayers (which are considered as a whole), selected liquid measured by power compensation patented by the manufacturer using two heated elements (stoves). Heating mode from 0.1 to 500 K/min., temperature range of from -100 to 700 °C, isothermal measurement combinations. Precisely defined ambience of the area, controlling the flow of gas. The possibility of measuring in a protective gas atmosphere and in air. Software Pyris, cooling by IntraCooler 2. Universal high temperature microcalorimeter (DTA) and the magnetic termogravimeter (M-TGA) with a controlled change of temperature, the measurement in wide range (from room temperature to 1500 °C) at an interval of temperature (0.1 °C/min. to 100 °C/min.) with high linearity of increase or decrease of the temperature. Simultaneous measurement of heat output and changes in the mass or weight of the apparent magnetic samples. For an independent measurement of two different samples simultaneously. Mainly determination of melting point, freezing point and high-temperature phase transformations, for example. crystallization, recrystallization, oxidation, polymerization, decomposition process, melting and solidification and phase transformations of other solid and liquid samples. It can determine the purity standards and also other materials and thermodynamic parameters (transformation warm, specific heat, etc.). Measurement in the mode M-TGA in the presence of a magnetic field intensity to 20MT. 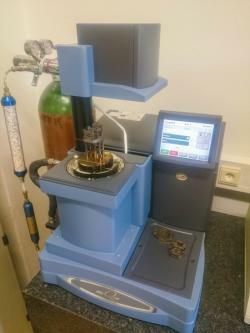 Measurements of thermal power of milligram bulk samples with well-defined shape and shapeless baggy-sample; powder samples, in the form of thin strips, films, multilayers (which are considered as a whole), selected liquid precisely defined ambience of the area, controlling the flow of gas. Possible type of atmosphere in the measuring cell – inert gas, nitrogen, oxygen, air. The software to control the measurement and evaluation of the measurement. Measurement of modulus of elasticity, flexural modulus, tensile modulus and the modules in the pressure, measurement in measuring modes tension, compression, bending, three-point bending. The dynamic load of the sample at a frequency of 200 Hz up to a force in the range +/- 10 N with a resolution of 0.002 N, the measurement temperature range in the range from -150 °C to + 600 °C, a measurable range of Young's modulus in the range up to 1000 - 1012 Pa within 1% accuracy. Sample holder for measurement in single mode beam mode and beam fixed in two points (single and dual cantilever clamps) sample holder for measuring pressure, sample holder for measuring thin films and fibers. Sample size: thickness of 20 microns, the maximum size of the samples 50 mm x 15 mm x 7.0 mm. The software to control the measurement and evaluation of the measurement.. Apparatus for recording electron diffraction in precession mode including a CCD camera to capture, visualization and microscopic analysis with guiding display. 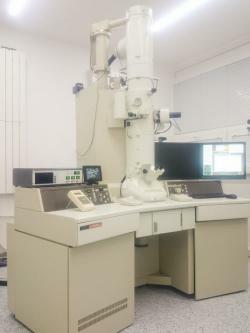 The device is universally connectable to a transmission electron microscope (JEOL currently the 2000FX), it is able to capture an image electron diffraction of TEM shield at up to 100 frames per second at a resolution of at least 128 x 128 pixels with a dynamic range of at least 256 gray levels with fast adjustment exposure. The device is connected to control and evaluation software is available database software. The device provides for the work in a fashion electron diffraction of a diameter of the electron beam 5 and 50 nm, allows the precession of the electron beam in the range of angles continuously from 0 to 3 degrees, and provides for raster scanning the surface of the sample in a transmission electron microscope in steps of 50 nm, and the location of the dot patterns for the subsequent construction of relevant maps. 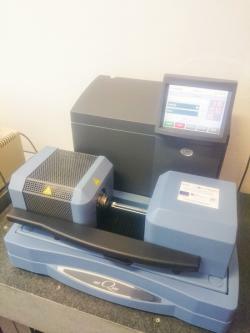 The device can advantageously be used for determining the orientation and phase maps samples from a set of records electron diffraction, their evaluation and correlated with the records from the database of step at a few nanometers in real time. 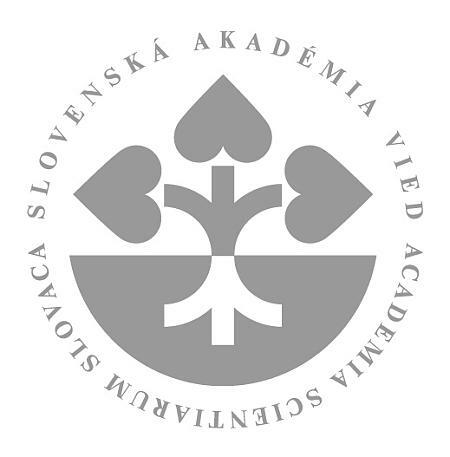 It is useful for the analysis of these types of nanostructured materials. Series of devices for thining preparations for TEM by ion dust extraction and vapor deposition of protective layers. Series of devices for fine mechanical polishing and lapping preparations for optical, scanning and transmission electron microscopy. Rtg Bruker D8 diffractometers, Siemens 5000, Bruker GADDS with heating, cooling and environmental chambers, and the combination of different elements in X-ray, optics. 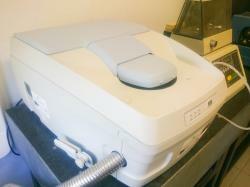 Series of calorimeters Perkin Elmer DSC7, DTA7, thermogravimetry TGA7. Series of annealing stoves with the possibility of application of an external magnetic field and mechanical stress. Equipments for precision resistivity and dilatometry of tape samples. 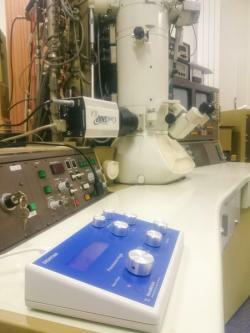 Equipments for basic magnetic characterization of soft magnetic materials. Apparatus for preparing of alloy ribbon by rapidly cooling the melt, an apparatus for preparing volumed amorphous metallic materials by the vacuum casting method. 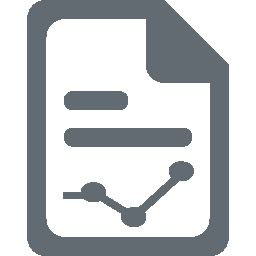 Database of the structures and modeling software for first principle modeling of the structures.